What Makes the Honda Accord the Right Car to Drive? The Honda Accord has been on the market for several decades and has been one of the vehicles we’ve enjoyed driving on the roads. When you step inside the new 2018 Accord you’re going to see an all-new interior that is roomier and more sophisticated than the model that it replaces. In the front and center of the dashboard, you’ll see an available eight-inch infotainment system that offers you a large display and tons of colors. The rear seat is cavernous and offers plenty of legroom while being able to be equipped with seat heaters to give you a more comfortable place to enjoy the ride. As you take a look at the exterior of the new Honda Accord, you’ll see a car that’s shorter, lower, and wider than the previous model, which spells out sportier. The hood has improved aerodynamics and you’ll see an underbody aero kit that helps ensure you can have the fuel mileage you’re looking for. This car is able to offer you more to look at as you step up the different trim levels and find more of what you want for the drive on the roads in your area. The 2018 version of the Honda Accord is offered in five trims, LX, Sport, EX, EX-L, and Touring. 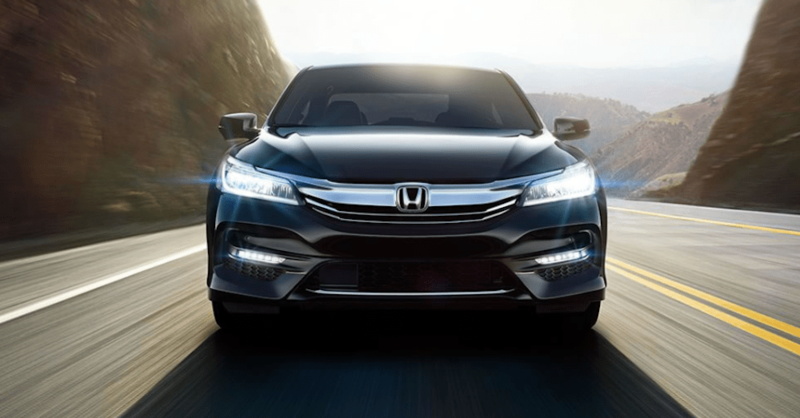 The base model gives you the Honda Sensing suite of safety features, push-button starting, dual-zone automatic climate controls, 17-inch alloy wheels, LED low beam headlights, a multi-view rearview camera, a seven-inch audio display, Bluetooth connectivity, and automatic on/off headlights. Options you can have include items like a power moonroof, a remote start system, heated front seats, leather upholstery, a 450-watt audio system, and a navigation system that can connect you to what you want and give you the ability to get where you need to go. Under the hood, you’ll find a base powertrain which is a 1.5-liter turbocharged four-cylinder engine that gives you 192 horsepower and 192 lb.-ft. of torque while being attached to a CVT for the drive. The Sport trim gives you a six-speed manual for the drive with this engine. Moving up the line, the 2.0-liter turbocharged four-cylinder engine offers you 252 horsepower and 273lb.-ft. of torque while giving you a new ten-speed automatic transmission. The hybrid powertrain uses a 2.0-liter engine and an AC Synchronous Permanent-Magnet Electric motor which uses a CVT to give you a greater level of fuel mileage for the ride. If the right vehicle for you to drive is a sedan that has a large number of qualities to make it fun and active on the road, the Honda Accord for 2018 can be the right model for you. Make your way to your nearby Honda dealership and see if this is the car that you’ll want for the ride you’re looking to enjoy. Take a drive and get a feel for the new Accord which is the midsize sedan that can put a huge smile on your face.